This is the fourth of 14 films that I was “forced” to watch by my fellow bloggers who participated in my Blogiversary Contest last month. This movie was chosen by Robb. Tnx for the suggestion. Let’s see what I thought of it…. 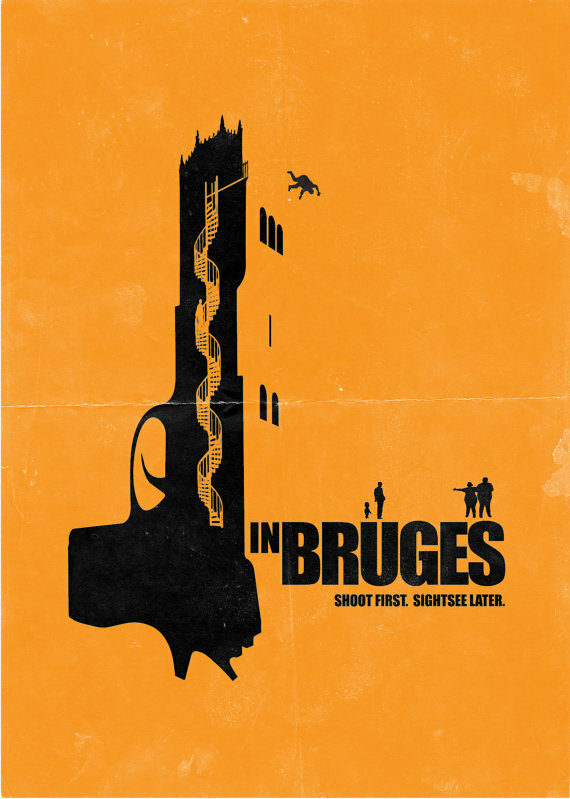 Brief Synopsis – Two hit men are sent to a quite Belgian town after they botch their previous assignment to await further instructions. My Take on it – This film tries to sell us on the idea that hit men can be normal people when they are not in the midst of a “job” for their employer especially when they might actually have a conscience. It works most of the time mainly because of the great chemistry between both leads Brendan Gleeson and Colin Farrell. The characters are both very different yet they act and feel as if they have been friends for many years and know each other quite well. They do cause a lot of hi jinx during their “vacation” time and it’s all really fun to watch even though it sometimes leads to some crazy situations that one wouldn’t normally encounter. The one drawback of this film IMHO is the fact that it too often feels like they are trying to create a new version of Jules and Vincent from Pulp Fiction (1994) and play them as Irish gangsters instead of Americans. Bottom Line – Does a great job trying to show that hit men are real people when they are not “on a job” and how they deal with what they have done. Farrell and Gleeson have amazing chemistry together and it’s quite believable that they have worked together for years. The hi-jinx that they cause during their “vacation” is fun to watch despite the fact that things keep getting out of control. In some ways this feels like they are trying too hard to create a new Tarantino film using Irish characters instead of the American ones we all know and love. Recommended! This movie is a small gem. Nominated for an Oscar for it’s screenplay.As you said – the chemistry between Gleeson and Farrell is excellent, but I disagree with your premise that it’s main point is watching “hit men” act “normal” when they’re not killing people. It’s about the mental unraveling of a man who accidentally kills someone – not his target – and how it affects him going forward. It is beautifully set up and paid off in a harrowing/funny/touching ending. This movie came out of nowhere for me – saw it on it’s original release – and it really touched a nerve. I loved it. It certainly had some absurdly comic moments, but it struck me as more of a black tragedy – for most concerned. I’m glad. I hated botched accent jobs. I was totally awestruck by this film as well. I was not expecting to love it. I nearly, nearly gave you this one to watch! I enjoy this movie so much. Good thing u didn’t. .. two for the price of one! I had a lot of fun with this movie. I want to watch it again now.